Last week was the second Newaukee Night Market of the summer. Basically they shut down the stretch of Wisconsin Ave along Grand Avenue Mall and bring in food vendors, local artists, and all kinds of entertainment for a pop-up market in the heart of downtown. First order of business: Bring cash. Adam and I went home hungry because every food vendor we approached was cash only. I don't know that they are all necessarily cash only — maybe we just had bad luck. But the cash-only food looked and smelled absolutely amazing, so we will for sure be bringing bills and pigging out next time. If you're a shopper, make sure you get there earlier. I found that as it got darker, it got harder to shop (some booths didn't have the best lighting). And the shopping is so worth it. Handmade Milwaukee merch, soaps, candles, jewelry, drawings, paintings... The list goes on. As we walked around, all I could think was "I wish I had gobs of money to support all you local geniuses!" Alas, no gobs of money here. Beyond food and shopping, there's entertainment throughout the market. We passed a giant game of chess, an ice sculptor, and breakdancers turning flips and handstands to a DJ's beat. There were a lot of people — and a great mix of people. The entire scene felt like a coming together to support local businesses, celebrate summer in Milwaukee, and breathe some life into an otherwise sad stretch of this downtown street. Here's hoping this effort by Newaukee leads to more great things for city center — I know the Night Market certainly shined a spotlight on all its potential. This year's final two Newaukee Night Markets are August 19th and September 16th. I'm a big fan of chicken salad — it's probably one of my favorite sandwich fixings. You never can tell about those deli meats — that's what I always say. But a beautifully shredded chicken salad with the right mix of mayo and crunch and spices? Yum. This particular chicken salad (which I've doctored up) gets some south-of-the-border flair with the addition of three kinds of peppers, lime juice, and cilantro. It's a little tangy & spicy and a whole lotta fresh & delicious. 1. Salt and pepper the chicken breasts, then place them in a slow cooker with some chicken stock for moisture. Cook on low or high. Once cooked through, shred the chicken. 2. In a large bowl, mix the lime juice, mayo, mustard, and cumin. Add the chicken, diced onion, diced peppers, and can of diced green chiles. Add cilantro. Mix together, adding salt and pepper to taste. You could also try using plain greek yogurt in place of mayo, or a mix of the two. Of course this chicken salad would be awesome on some good crusty bread, but in an attempt to make healthy choices I served it on a bed of spinach instead. First, I dressed the spinach with a sprinkle of olive oil, lime juice, salt, and pepper, then placed a whopping dollop of chicken salad on top. In an ideal world, I'd garnish with chopped or sliced avocado. Mmmm fiesta in your mouth. The Pancake House. Okay, so this isn't a revolutionary breakfast joint. I'm sure you've all been there at least once if not many times — they're all over the place after all. And they serve the best bacon: Nueske's bacon. It's thick-cut and Mmmm. Eat it. Eat all the bacon. Alright, so everybody loves bacon. But there's one menu item that I think is still flying under the radar, and so I must preach. Two words: Dutch Baby. On more than one occasion, I've mentioned the Dutch Baby and gotten blank stares. No babies were harmed in the making of this breakfast — it's just a pancake the size of a baby. Or the size of a skillet, really, because that's how Dutch Babies are made. Basically you whip up runny pancake batter, pour it into a hot skillet, and stick the entire skillet in the oven to cook the pancake. The batter will creep up the sides of the skillet, resulting in thin, crispy edges. The center of the Dutch Baby might puff up, but it will deflate once it's out of the oven. Then you douse the Dutch Baby in butter and powdered sugar and top with a lemon wedge — maple syrup optional. It's amazing, and you can find it at The Pancake House. The Dutch Baby can and probably should feed two people... But really, you might just want it all to yourself. 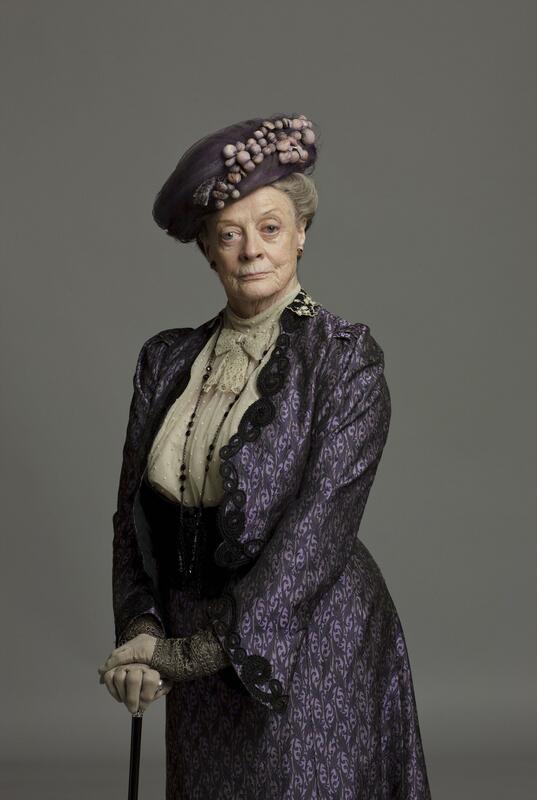 When I first heard that the costumes of Downton Abbey were coming to Oshkosh, I was all "Exsqueeze me? Baking powder?" The exhibit is only making a handful of stops in the U.S. and Oshkosh, Wisconsin, is one of them? Alright then. Surprise aside, I knew my mom and I would have to make the journey to see those gorgeous gowns up close. When we arrived at the Paine Art Center and Gardens, it suddenly clicked as to why this exhibit is stopping in Oshkosh. The Paine is a drop-dead-gorgeous mansion — an English-style country estate in the middle of Wisconsin, totally in sync with the era of Downton. The house was built in 1925, commissioned by the Paine family as an ode to their English heritage. The architect purposely designed the house to include varied architectural details to give the impression that the house had been built over three centuries of evolving English styles. The house is a museum normally with lovely botanical gardens, but the costumes of Downtown are taking over the place from now until September. Guests tour the house as they normally would, but with exquisite Downtown garb strategically placed throughout. As Downton fans, I can't stress enough how worthwhile a trip this was. As a lover of this era's architecture opulence, visiting the Paine would be worthwhile even without the Downton lure. The gardens and the manor itself are breathtaking. Of course, security personnel thwarted most of my attempts to sneak a photo, so I don't have much to show in the way of interior pics. But trust me when I say it's every bit as grand as Downtown, if decidedly more Wisconsin-sized. But with Mom as a lookout, I was able to snap a couple quick photos (Rebel's my middle name). The exhibit showed everything from outerwear to men's evening wear to those Crawley sister dresses we all drool over. Each of the costumes was accompanied by a little plaque with some info about the piece. Most also included a photo of the costume being worn in the show, making the magic all the more real. We were told when we arrived that these are all the actual costumes worn by the cast (no faking! ), and that all of the costumes were made to the actors' measurements. Therefore, the mannequins are true to size. Let's just say Michelle Dockery is a waif. A talented, beautiful waif for whom I have insane dress-up envy. While most of the pieces are entirely new, some of the costumes incorporate bits of clothing from the era. We saw one gown with beading from the early 1920s; the costume designer had used the beaded overlay and constructed a new lining to complete the costume. I think my favorite pieces to see were Cora's flower show ensemble and the Dowager's signature purple frock. Of course security was tight around this room, so alas, no pics. You'll just have to go see for yourself. And save room for the gardens! They're enchanting. Dressing Downton runs through September 20th & opens at 10:00 AM daily. I've heard about Door County fish boils for years but never had the chance to try one until recently. While camping in Peninsula State Park, we took time away from nature to venture to Fish Creek and Pelletier's for a fish boil. None of us really knew what to expect, aside from the obvious boiled fish. But it was so much more than that! The man who owns Pelletier's (and looks like Brett Favre) boils seven giant vats of fresh fish every single day, and he's been doing it for (I think he said) about 30 years. The water is seasoned with pounds (yep, pounds) of salt, then in go the fish. The filets hang out in the boiling water for a solid chunk of time, with the man in charge setting wood in and around the fire to adjust the cooking temperature; there's a real science to it. When the fish is good and cooked, Favre throws some sort of lighter fluid on the fire which ignites in a burst of flame and heat and forces the fish to boil over. Voila! Fish boil. The eating was delicious. After the fish boiled over, they took it away and plated it with red potatoes, a small pearl onion, cole slaw, lemon, and pools of melted butter. The fish still had its skin and bones, which was a bit of a new adventure for some of us — picking out them bones is hard! But so worth it. There was also white and rye bread with butter at each table, and for dessert: Door County cherry pie. Needless to say, it was all amazing and I would do it again in a heartbeat. I'd say we should bring the fish boil concept to Milwaukee, but it turns out it really is a practice that's native to Door County — I think we should let them keep their awesome tradition. Looks like we'll just have to drive three hours north more often! I'd been for-real camping once before with my family — raccoons got at our food, and that's about all I remember. Other faux-camping adventures include sleeping in tents with friends in the back yard the summer after high school — quite the outdoor resume. But what can I say? As Jack Dawson thought of Rose, I'm more of an indoor girl. But when my friend Fritz invited us camping with her boyfriend Tim and his brother & sister-in-law, Adam and I jumped at the chance to get out of Milwaukee for a couple of days. Luckily for us, Fritz was well stocked with camping gear and I borrowed an air mattress, so all we really had to do was pack our bags, shop for s'more stuff, and get ourselves three hours north to Peninsula State Park in Door County. We arrived Friday night just in time to meet our friends for a cherry cocktail and see the last bit of sun sink below the water's edge. Then it was back to the campsite for pudgy pies — a campfire delicacy that neither I nor Adam had ever heard of. Basically it's a grilled cheese sandwich. Shout out to Tim and his SIL for making such delicious ones for Adam and me (we really did get the 4-star treatment). That night we walked to the nearby beach and looked at the stars. It might sound corny, but it's true: You can see forever and it's mind-blowing. Of course our conversation naturally progressed to aliens and our place in the universe — your typical star-gazing chatter. On Saturday morning, the skies threatened us with a storm. A big one. Fritz and I went to move cars around and we could see the ominous front moving in. We pretended the thunder was a T-Rex as we raced the rain back to camp. I love that I have friends who aren't too old for a quick game of Pretend. For dinner, a scrumptious fish boil at Pelletier's. There was a pillar of fire, pools of melted butter, and Door County cherry pie — but more on the fish and accompanying showmanship in another post. Lunch on Sunday was a trip to the Cookery, which I actually thought was just okay and (snob alert!) not quaint enough. Sorry, not sorry! In all the adorableness of Door County, I just wasn't all that impressed with my salad or the ambiance (though the patio looked nice). I really wish we'd had more time to explore Fish Creek and its neighboring towns — another day would have been perfect. Friends, do you have any favorite Door County spots to visit? Do tell! 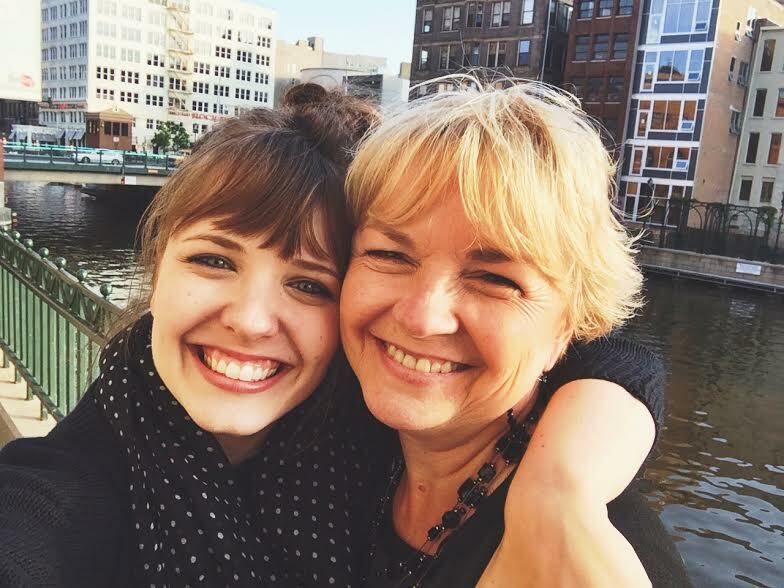 Earlier this month, my cousin's daughter Gloria made her yearly trip up to Milwaukee. I don't get to see her often — in fact, it really has been just once a year for the past few years. It's always an event, seeing how much she's grown. I remember a few years back when she was bored at the Winnie the Pooh movie and uber-scared of Ursula in The Little Mermaid. Last summer Gloria unleashed her inner goofball, helped in the kitchen, and sobbed when she lost at Old Maid (there's no shame in that — I cried plenty over Candy Land in my day). Now Gloria is seven. She'll be starting 2nd grade in the fall and she's been keeping up with her studies this summer. In fact, when I picked her up for some quality hang-time (read: mac n' cheese, Aladdin, and hot fudge sundaes with two kinds of sprinkles), she brought along a 200-page workbook, the likes of which she actually completed during the car ride over to my apartment. I love her enthusiasm for adding, subtracting, and greater than/less than! Her other big things include: plans to start a band (we've all been there) and the phrase "On a scale of 1 to 10..." — and using it properly. For example, "On a scale of 1 to 10, I play the piano a 9." That's some amazing in-your-face confidence, and all I can do is hope little Gloria never loses sight of that. Hey, you can't blame a girl for hoping! I can't wait to see what next year brings. I'm not sure if this really is a hidden gem or if it's just been hiding from me and Adam, but entering the patio at the Cafe at the Plaza feels like stepping into a secret garden. The walls are covered with lush, green ivy — so covered, it lends credence to something Adam has always said (and I've always disputed): "You can never have too much ivy." Usually I would argue that you can have too much ivy; I prefer a balance. But then this little cafe patio made me eat my words — and some other mighty delicious things. But back to this spot's secret-ness for a moment: Am I alone in not even knowing there was a Plaza in Milwaukee, let alone this magical cafe? Okay, maybe I've heard whisperings of the Plaza, but only hardly. And the reality made me wonder how people haven't been shouting about this place. 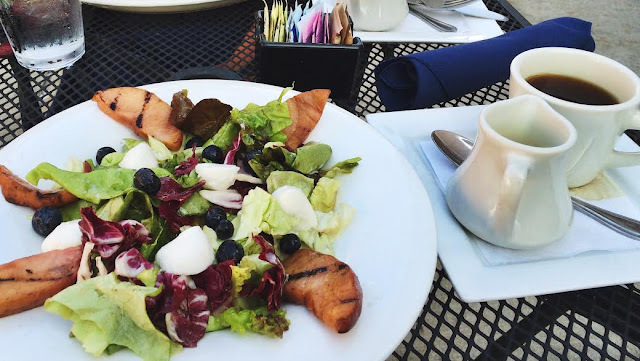 Not only is the patio utterly charming, but the food — oh the food! I don't often say "these pancakes are life changing," but this time I couldn't help myself. Lemon poppyseed pancakes with blueberry syrup. The pancakes were thin with slightly crispy edges and flavor that can stand on its own. Add a morsel of melting butter to each cake and it's heavenly; pair the cakes with blueberry syrup and there's your "life changing." It's almost like my breakfasts up until now have been a sham. The rest of the menu looks scrumptious too, but I admit it will be hard to tear myself away from these lemon poppyseed dream cakes on future visits. Still, I'm determined to sample other deliciousness next time — and I hope that time is very, very soon. July 2016 update: If you're with a group, spring for a couple of starters. The Polish Coffee Cake is heavenly. The Breakfast Poutine is my new favorite thing and I imagine it would cure even the most hellish of hangovers. What's in it? Waffle fries, chorizo sausage gravy, two poached eggs, WI cheese curds, and avocado cream. It's a gooey, cheesy, eggy, life-affirming mess of delicious. Like, that last-meal-on-earth kind of delicious. One final FYI: Maybe don't get the Breakfast Burrito. I have it on good authority that it will leave you wanting. But the poutine — always the poutine! Beer gardens are popping up more and more in and around Milwaukee, but I've only been to one: the Beer Garden in Estabrook Park. I plan to try the others, but I'm also totally content with this one, brought to you by the Haufbrau House. There's a quaint little concession stand selling brats, giant pretzels, beer, and root beer. There's sun, shade, plenty of picnic tables, live polka music (sometimes), and string lights connecting the leafy canopy for nighttime ambiance. 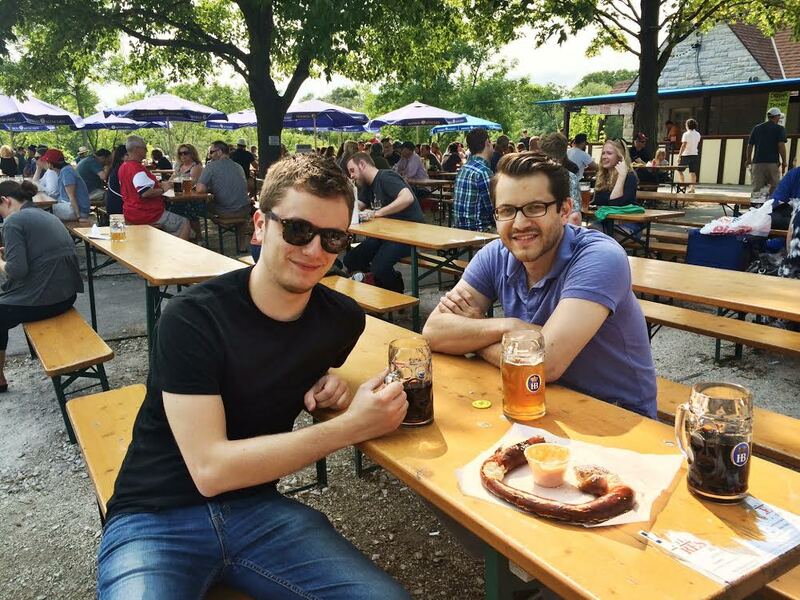 We went to the beer garden a few weeks ago in the mid-afternoon. It was bustling with folks around our age, families with kids, parents with babies, people with puppies — all ages really. It was the babies and puppies that really stuck out to us, highlighting the fact that this is a place where you can bring your toddler or terrier and hang out for hours if you like. Where else but a park could be that inclusive? 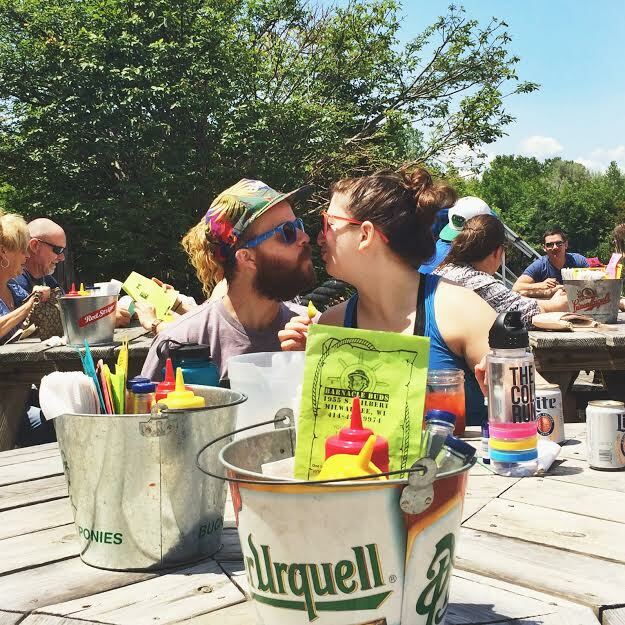 Add the fact that there's a playground a stone's throw from the beer garden and you're in family-friendly heaven. And there's food. And booze. And non-alcoholic refreshments too — the classic "something for everyone." I went for a Sprecher root beer and a ginormous soft pretzel. 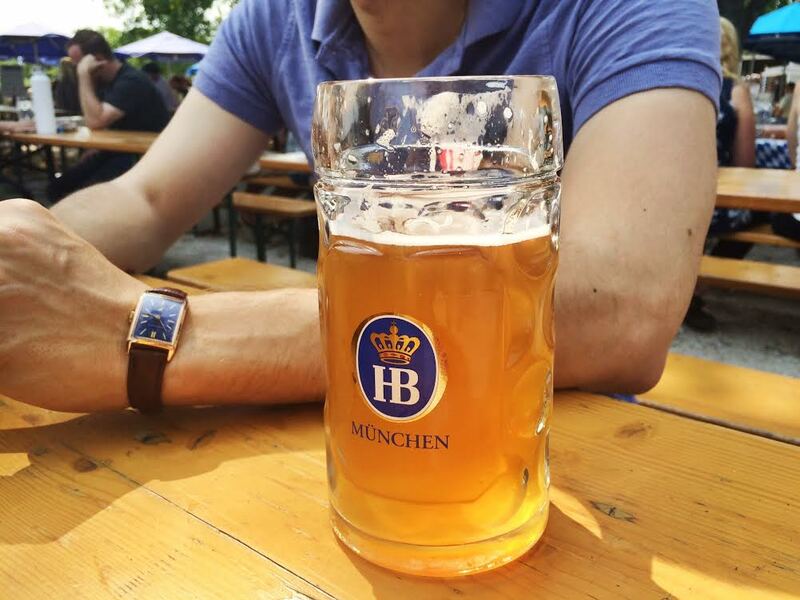 The prices for drinks aren't terrible, but there is a refundable $5 deposit for each beer stein — and the whole operation is cash only. So come prepared with cash or be prepared to use the resident ATM before getting your eats and drinks. 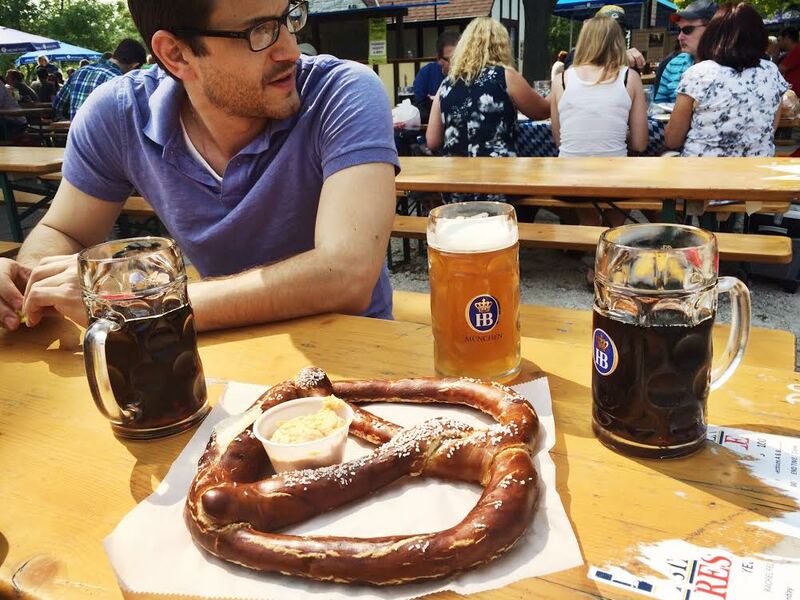 The pretzel, admittedly, isn't cheap. And then you have to pay for the cheese spread on top of it all. I say "have to" because you truly have to — it's so, so yummy and is totally worth the $3 price tag, in this cheese-lover's humble opinion. 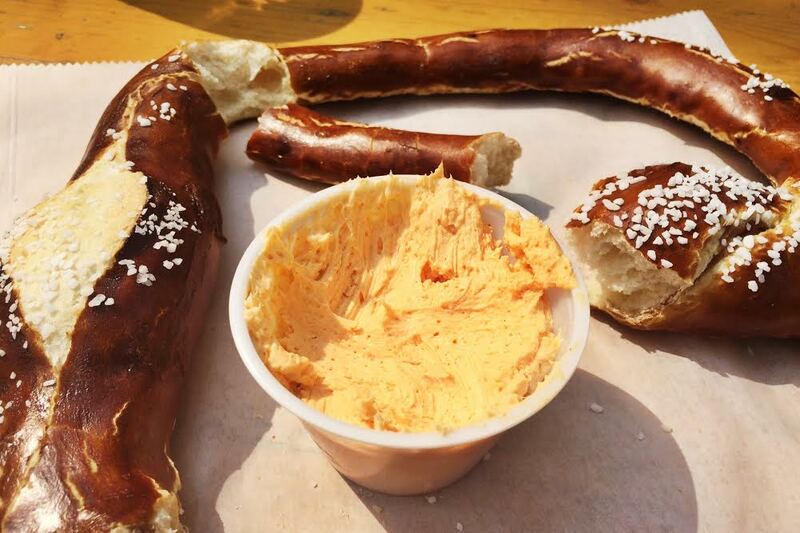 Mmmm cheese and bread and beer in the great outdoors: A Wisconsinite's dream. Props to you, Germany. Before seeing Motown last week, my mom and I dined at Port of Call. We'd kind of exhausted the other obvious options around the Marcus Center: Rumpus Room, Rock Bottom, Water Street Brewery... We weren't overly impressed with any of them. Well, my mom wasn't — I actually did enjoy my sandwich at the Rumpus Room and would for sure go back. But overall, the dining around the PAC is a bit of a disappointment (not counting the pricey Kil@wat, which I have yet to try). We'd hoped that Port of Call would prove to be wonderful and thereby solve all future theater district dining issues forevermore. It wasn't meant to be. My mom enjoyed her burger, but my salad was kinda sad. I just kept thinking of ways to make it better: different cheese, adding nuts, etc. I'd maybe go back someday and try something different, but I'm not clamoring to return. Sorry Port of Call! But they do have a nice patio, with a lovely view of downtown Milwaukee and the river. But proceed with caution: The wind was blowing in such a way during dinner that the glorious smell of the river wafted our way. But we smiled through the stink and the salad that left me wanting as we took the riverwalk from Port of Call to the Marcus Center. That's one bonus: The riverwalk is pretty great and makes up for a lot of mediocrity. I just wish there were more no-fail, affordable dining options closer to the PAC. If anyone out there has a suggestion, I'd absolutely love to hear it! 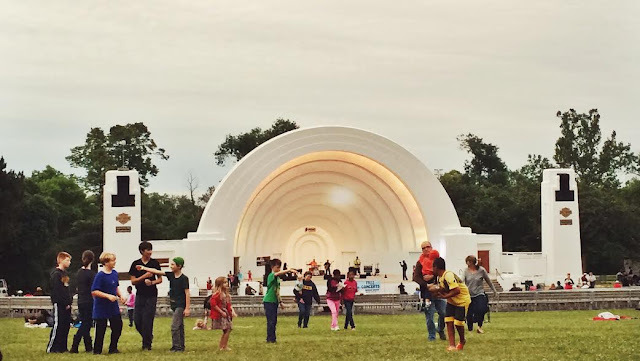 Every Wednesday this summer at 6:00 in Washington Park, there's live music at the Shell. Not to brag or anything, but my good friend Jane the Wonder Woman kinda coordinates the whole thing. She's awesome, so it makes sense that Wednesdays at the Shell is awesome, too. The Shell itself is an old-fashioned band stand, like something from a movie. 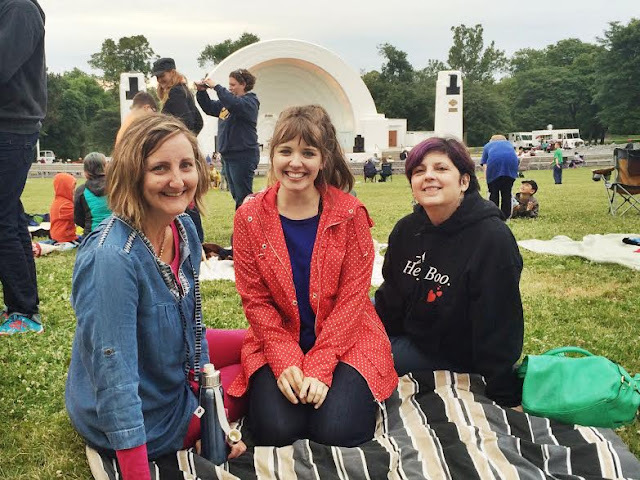 There's seating all around the shell and a sloping, grassy hill beyond — lots of space for a picnic with family and friends. Need dinner? There's a food truck for that. 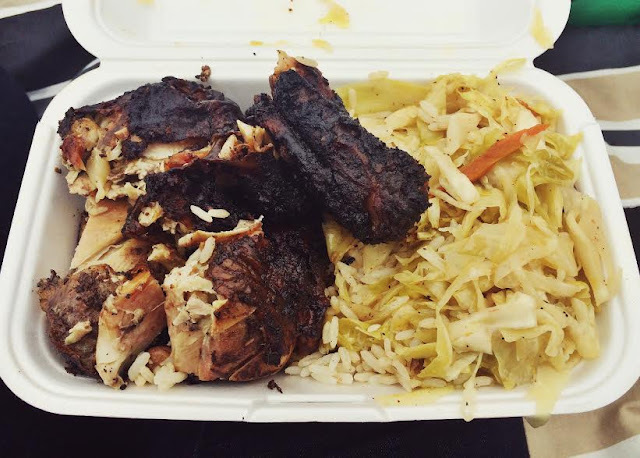 I took my hungry self to the Jamaican Kitchen for a jerk chicken dinner. The dinners come in three sizes (small, medium, large), each with a side of rice and plantains. Super yummy, and while too-much-food is a good problem to have, I'd still go for the small next time instead of the medium. The music was good. If you really want to enjoy the tunes, plan on sitting close to the stage. Or if your main goal is to catch up with friends with live music in the background, a blanket on the hill works just fine. The Shell packs in all manner of musical genres and brands of entertainment throughout the summer, so find a night that speaks to you! I'm hoping to go back in August — two words: fire dancers. 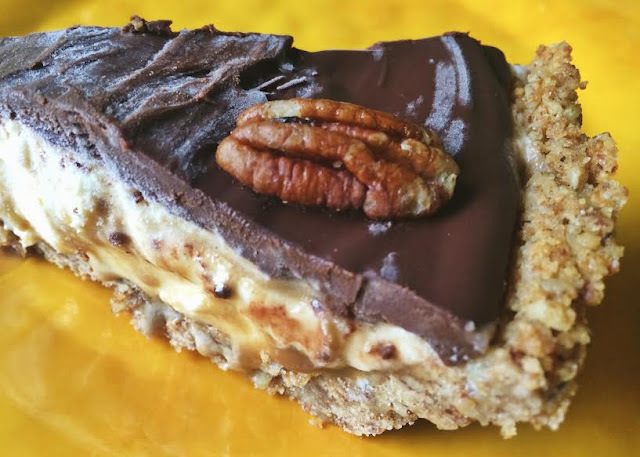 A healthy gluten-free treat — no really! 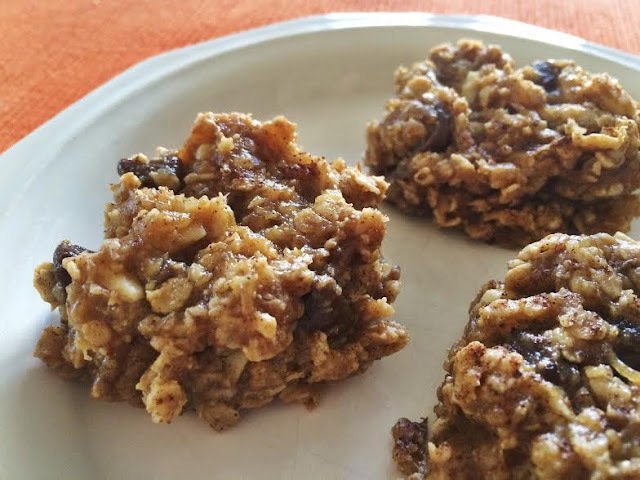 I hate the term "healthy cookies" as much as the next butter and sugar lover, but these cookies make healthy addictive. 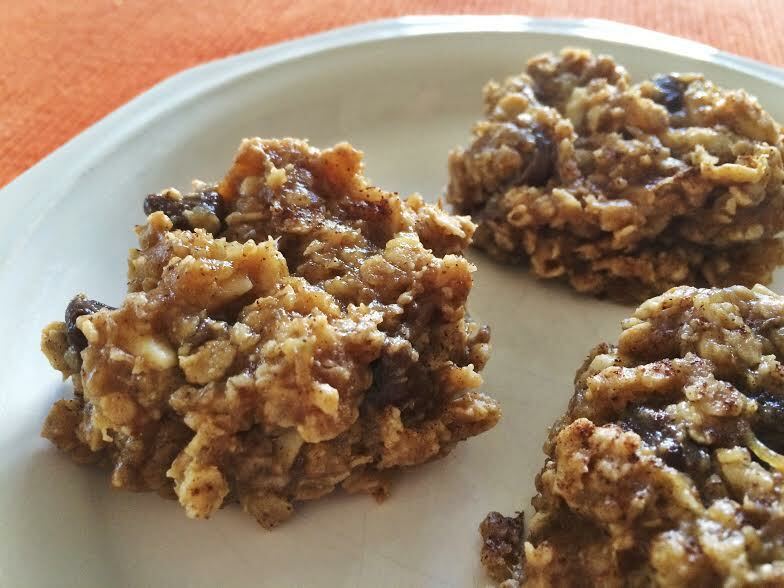 They're little nuggets of delicious natural things mixed together, scooped onto a cookie sheet, and baked for just 15 minutes. You can mix them up in one bowl, bake them on tin foil or parchment paper, and voila! Something scrumptious and healthy with minimal clean up. Here's the main cast of characters: quick oats, almond or peanut butter (I really use them interchangeably), maple syrup or honey (I've been using honey), and bananas. What makes these cookies sing, of course, are the semi-sweet chocolate chips and sliced almonds — both optional, but why would you opt out of such deliciousness? 1. Preheat oven to 325 degrees. Line a large cookie sheet with parchment paper or tin foil and set aside. 2. Combine the oats, salt, and cinnamon in a large bowl and mix with a fork to combine. Add nut butter, honey/maple syrup, mashed bananas, and vanilla and use a large spoon or spatula to mix until combined. Fold in chocolate chips and sliced almonds. 3. Drop spoonfuls of batter onto the prepared cookie sheet. I measure 1 TBS of batter, round it out, and make each cookie that size — but you can do more or less dough per cookie as you like. Use the back of a spoon to slightly flatten the top of each ball of batter (the cookies will not spread in the oven). Drizzle each cookie with a touch of honey/maple syrup and a sprinkle of cinnamon. 4. Bake for 15 minutes until the cookies are baked through and will hold together. Let them cool at least 10 minutes before removing from the cookie sheet, then transfer to a wire rack to cool completely. Cookies will stay fresh at room temperature for one week. I don't think of these cookies as dessert really. They're not going to replace turtle sundae pie or killer brownies. 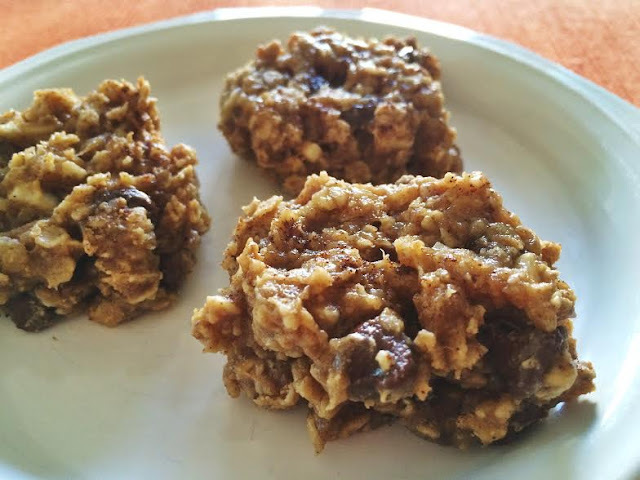 I think of these cookies as a granola bar, on-the-go breakfast, or something to cure my sweet tooth in a healthier way — and they've got me hooked! I'm a lucky girl. My mom bought us season tickets to Broadway in Milwaukee this past year, and we've had an absolute blast. Last night was our last show: Motown. I'd heard nothing but good things about it — people saying it's hard to sit still with one groovy hit after another coming at you. And they're right! The music is outstanding. I'd consider myself a radio fan when it comes to Motown; I love songs like "My Girl" and "ABC" as much as the next person, but I'm not die-hard into this particular genre. Even so, I recognized most of the tunes — ones that I always knew I loved and ones like "Boogie Shoes" and "You're All I Need To Get By" that I forgot I loved. Being reintroduced to this glorious music was a total treat. As for the cast that delivered the tunes, they really blew the roof off the Marcus Center. The voices were unique of course, but every one of them was soulful and buttery. True story: During some of the vocals, I was so caught up that I had to remind myself to breathe. Yep, this show's strength really lies with the music and the actors' delivery skills, and in this cast there wasn't a dud to be found. There was crowd participation when Diana Ross came out into the audience to make two somewhat-willing spectators join her in singing "reach out and touch somebody's hand, make this world a better place if you can." Then came the Kumbaya moment where she had us all hold hands, raise our clasped hands over our heads, sway, and sing those same words. It felt a little goofy — also tricky, because there was no way you could not participate without being a schmuck — but also inspiring to have a whole theatre full of people chanting such a positive message. If you can get past the Danny Tanner-ness of it all. So this is all well and good, but I can't deny coming away with a certain ambivalence. Of course the show was thoroughly enjoyable. There were times I wanted to jump up and dance. When the boy who played a young Michael Jackson absolutely nailed all his numbers, I was full-on grinning from ear to ear. But upon reflection, what this show lacks is emotional depth and strength of story. Not that the story isn't there — it must just be the way it's scripted that falls a little flat. The show includes key moments in history — the assassinations of JFK and Martin Luther King — and while these are plenty-affecting subjects, I just didn't feel that affected. The closest I can get to a fair comparison for Motown is Jersey Boys. Jersey Boys is also a sort of musical review, but I feel like the staging, story, and overall package worked better in Jersey Boys. I mean, remember crying in Jersey Boys. 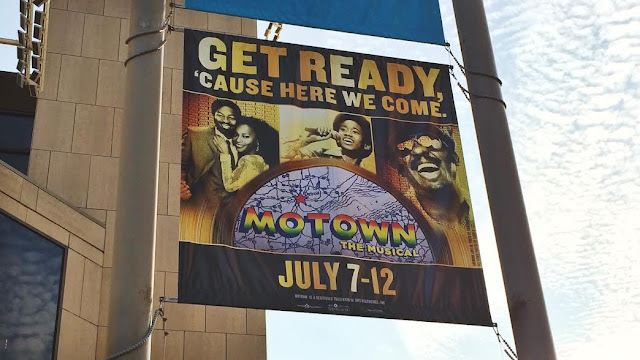 I wasn't really feeling it with Motown. It's like they should either have really gone there with the upheaval of the times, or found a way to artistically skate over it. Maybe showing newsreels without a song? I'm not entirely sure and I'm no expert, but that was my take-away. Lacking in story, excelling in song. So if you're a huge fan of this music, you'll flip out over this show. If you're a radio fan like me, you'll have a blast — but you probably won't obsess over it. 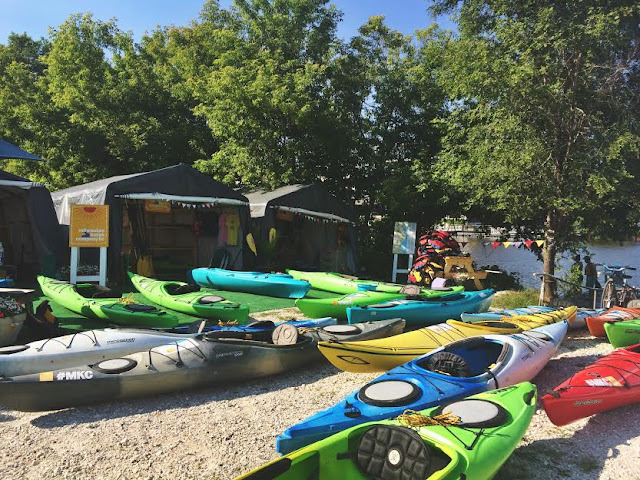 Adam and I had a blast with the whole kayaking thing a couple weeks back — and that day was also our first trip to Barnacle Bud’s. I’d been in the dark about this place for a long time it seems, but I recently started hearing great things about it from lots of people. A dockside restaurant that serves grouper sandwiches? Am I in Florida? For drinks, most of the group indulged in the weekend bloody mary bar or tropical cocktails in mason jars. I went for beer. Lots of us ordered grouper of some kind, and it was tasty — not mind-blowing, but tasty. And where else can you get a grouper sandwich in Milwaukee? I had my sandwich cajun-style (blackened with spicy seasoning) and Adam had his fried. Both sammies were topped with shredded lettuce, tomato, and tartar sauce with some sadly bland crinkle-cut fries. Nothing a little ketchup won’t fix, but still a disappointment. Would I go back to Barnacle Bud’s on food alone? I’m not sure. But it’s the combo of atmosphere and vacation-like eats that makes me say, overall, I’d very happily bop back to Bud’s. It’s just so cheerful and refreshing! The interior decor is plenty fun, too. 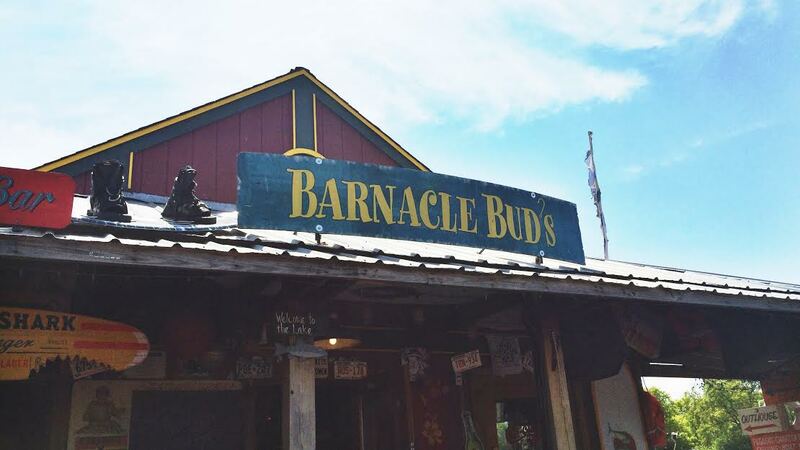 I can imagine sitting at the Barnacle Bud’s bar mid-winter would feel like a nice break from reality. But if you're able to go on a beautiful summer day, do it. This is one stay-cation you want to take! 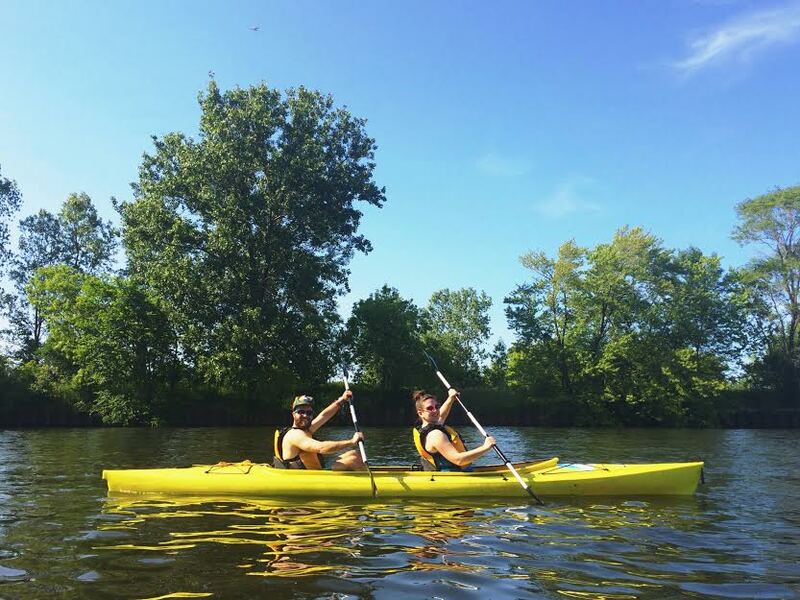 A couple weekends back, Adam and I stretched our kayaking muscles — and boy did they hurt the next day! Worth it? You better believe it. 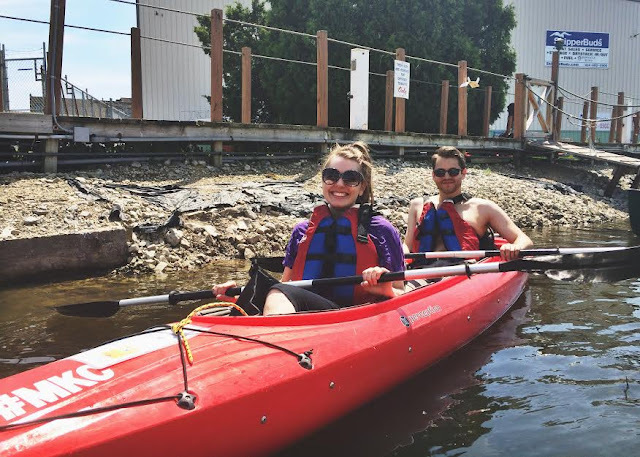 We joined a group of friends at Milwaukee Kayak Company around noon on a Saturday for an afternoon of experiencing Milwaukee from the river. Milwaukee Kayak Company makes it super easy to get on the water: Just sign a couple forms that say things like “We’re not responsible if you drown, thanks!” and pony up either $30 for a single kayak or $45 for a tandem. They outfit you with life vests and even offer free bottled water for the road (er, water). Then they say “Be back by 6:00!” The website says you’ll have the kayaks for 4 hours, but clearly the reality is much more relaxed — at least it was the day we went. The kayaking itself was crazy fun and quite the workout for these out-of-shape arms of mine. Luckily I had Adam to do a lot of the heavy lifting as we navigated the river in a tandem kayak. Still, I'll say this: I put in a valiant effort, and if I can do it, you can do it. But enough about arm strength. We had a blast! And I'll be first to admit that water sports aren't really my thing. Sports in general aren't really my thing. So saying "I had a blast kayaking for hours" really means something coming from me. The only down side was that, as Milwaukeeans might expect, the river sure can stink. Whew boy! But you get over the odor when you're passing under gigantic metal bridges as they close with a thundering clang, or come upon a railroad bridge with weathered box cars rolling by. 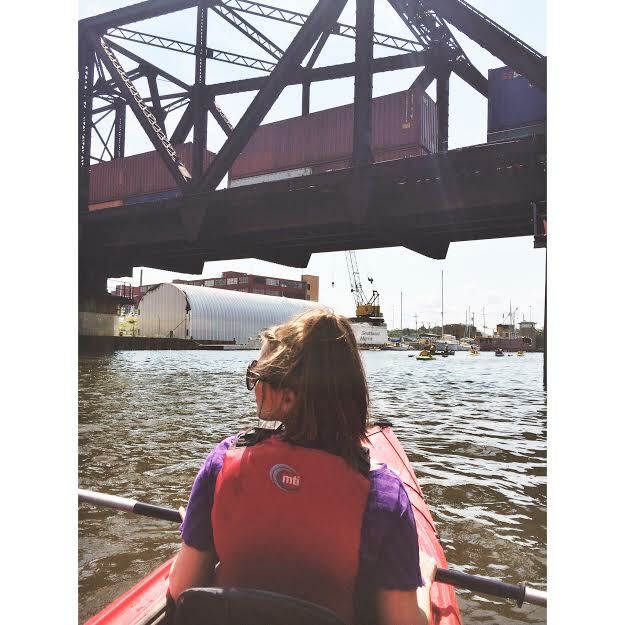 Seeing Milwaukee from the river offers a unique perspective — one that makes you feel keenly part of the natural world but also acutely urban. The urban factor came into play especially since our group chose to paddle away from the lake. 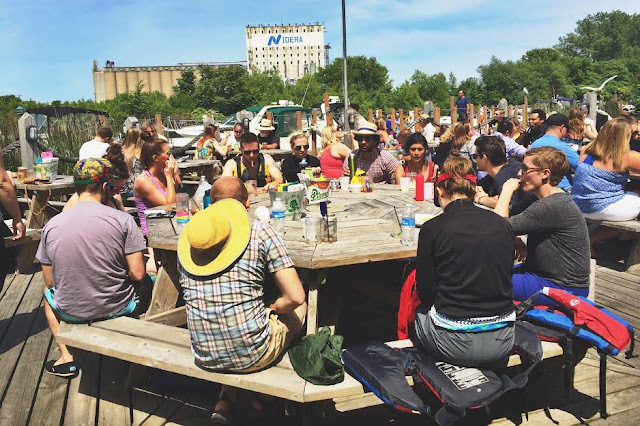 Milwaukee Kayak's dock is located near the Allen Bradley Clock, so heading up the river brings sights that are awfully gritty and industrial — but not without an oasis or two. 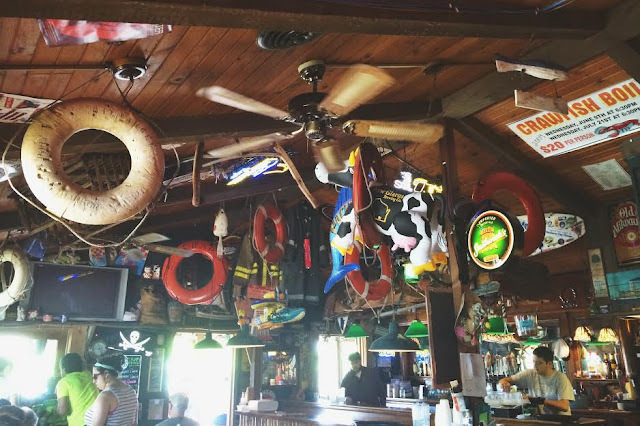 We stopped for lunch and drinks at Barnacle Bud's — a place I'd never been before and will delve into a bit more in another post. But first impressions: Vacation. Truly, when you're at Barnacle Bud's, it's like you've left Milwaukee for some beachside shack. Very refreshing. After lunch we paddled on, stopping for drinks and games of Bags at the Horny Goat. Here's where I demonstrated my hand-eye coordination deficiencies. And I'd never been to Horny Goat, but I quickly learned that the beer isn't so hot — at least that was the buzz around our group. Still, the place is cool for hang-outs on a sunny day. 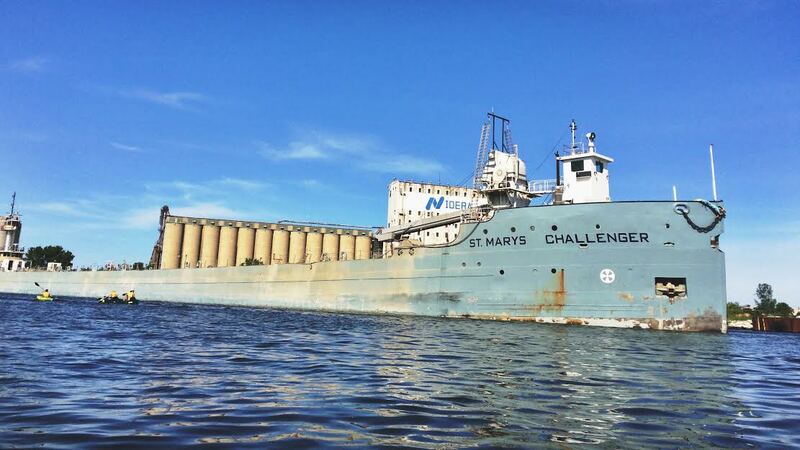 Five+ hours later, we were heading back to the docks when we all had to pull over and watch this huge ship, the St. Mary's Challenger, glide by. At first it was hard to tell if it was even moving — oh, but it was. That experience felt — like our entire day — pretty epic. July 4th was weird for me this year. Every year for as long as I can remember, we'd go to my Aunt Kal's house for major summer holidays to take full advantage of the pool — but she sold the house within the past year, and the July 4th celebrations kind of went along with it. So, since the rest of my immediate family had their own plans, there Adam and I were with nothing to do on Independence Day. Then Adam said, "I want a hotdog." I just laughed. To me, hotdogs have their time and place (and should always be grilled, ballpark-style), but I wasn't really there that morning. 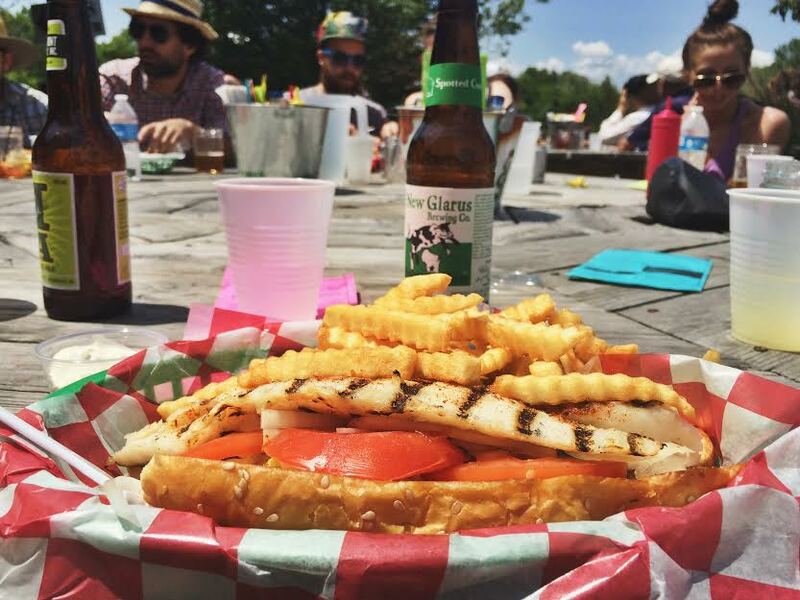 A few minutes later: "Man I really want a hot dog — it's all I can think about. Can we get hotdogs??" So we ran with it. 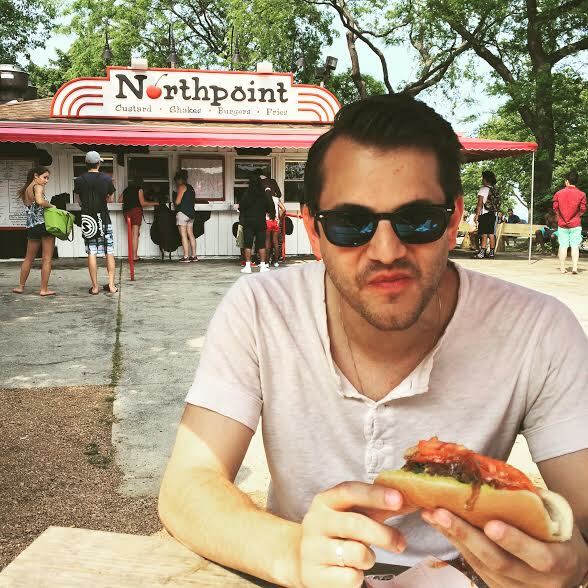 Neither of us had ever been to Northpoint, the Bartolotta's concession stand at Bradford Beach, but when we googled and saw they had all-beef hotdogs, the mission began. It was actually hot that day — perfect for a trip to the beach. Adam excitedly ordered a hotdog with the works and I went for the beach burger (avocado, lettuce, tomato, mayo, toasted bun) with cheddar cheese. The two of us ate for about $10 — not bad! And it was really tasty for a glorified concession stand. "Now don't you feel patriotic?" Adam asked through a mouthful deliciousness. Sure do. On Father's Day, my mom said we could just get a DQ ice cream cake for dessert. While those are certainly yummy, I decided Dad deserves homemade. Making this pie is simple, but there are a lot of steps. Lots of allowing to cool and freezing overnight, so read the recipe thoroughly before you start. Still, this one really is easy as pie! 1. DAY 1 --> For the crust: Preheat oven to 350 degrees. In a food processor, pulse the pecans until finely chopped. Mix the chopped nuts with graham cracker crumbs and sugar in a medium bowl. Mix in melted butter until evenly moistened. Press mixture evenly into bottom and sides of a 9-inch glass pie dish. *Note: I made more crust than the original recipe called for because I always find I need more. If you feel like you have too much, press it into the bottom anyway (it's so yummy you won't regret it!) — or just eat it with a spoon. 2. Bake crust until golden, about 12 minutes (if it puffs up, press it firmly back into place). Cool crust completely, wrap in foil, and freeze at least 1 hour. Keep frozen. 3. For the caramel sauce: In a medium sauce pan, bring brown sugar, cream, and corn syrup to a boil, whisking until sugar dissolves. Boil for 5 minutes, whisking occasionally. Turn off heat and whisk in butter, vanilla, and salt. Cool completely. 4. After sauce is totally cooled, take pie crust and ice cream out of the freezer. (You could carefully soften the ice cream in the microwave, but I just let it stand on the counter for 5 or 10 minutes.) Spread a layer of ice cream evenly over the bottom of the frozen pie crust. Spread a layer of caramel over the ice cream. Freeze pie until ice cream and caramel are firm, at least 1 hour. 5. Repeat with a second layer of ice cream and caramel sauce, freezing after, then adding a third layer of ice cream. FREEZE PIE OVERNIGHT. Cover and reserve remaining caramel sauce at room temperature. *Note: The original recipe says to use 1 cup of ice cream and 1/4 cup of caramel in each layer. I just eyeballed it, knowing I'd need to leave room for three layers of ice cream. 6. DAY 2 --> For the ganache topping: In a microwave-safe bowl, combine chocolate, cream, and corn syrup. Heat in microwave until chocolate just starts to melt, then whisk the mixture until chocolate is fully melted and everything is combined. Cool ganache at room temperature until it's thick but pourable. 7. Pour cooled ganache evenly over the frozen pie. Sprinkle with additional pecans so it looks pretty. Freeze until ganache is firm, at least 45 minutes. *Note: I cut back on the amount of ganache in the original recipe. I never thought I'd say this, but it was an overwhelming amount of chocolate! The caramel, crust, and ice cream combo are the real stars of this show — let them shine with the ganache as an accent. 8. To serve: Let pie stand at room temp for 5 to 10 minutes before slicing. 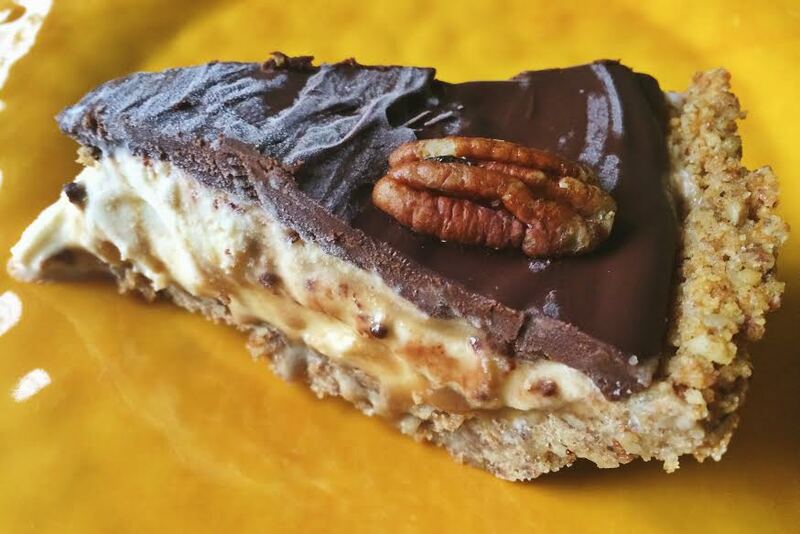 Warm remaining caramel and drizzle over each slice of pie. Yes, this is a pie for planners. I woke up Saturday morning and made the crust so it could cool/freeze. I stayed at home Saturday night, so I had plenty of time to stop back into the kitchen to add layers of ice cream and caramel, freezing between each. The next morning, I woke up and made ganache so it would be cool by the afternoon. I drizzled it over the frozen pie before dinner, then let it freeze together until dessert time. Sounds like a lot of putzing, but if I can do it, you can do it. And do it — it's so worth it!